We got back from our skiing holiday on Good Friday late in the night. I woke up on Saturday morning with the spectre of a million things to do. Unpacking, washing, shopping and most importantly preparing Easter lunch. I always want to make days like this memorable. I want to let my children know, that feast days when family and friend come together to share a long leisurely meal, are moments to look forward to. 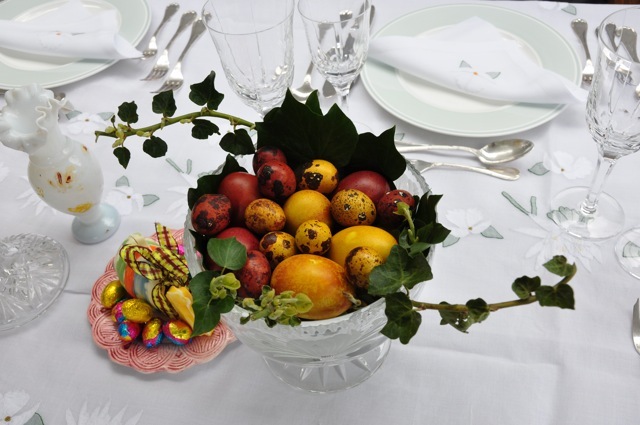 Setting the table is just as important as the food and the centrepiece at Easter are coloured eggs. I am not quite sure where the tradition comes from, but it is one that marks the day. Some say that women were carrying baskets of eggs on Easter morning; upon realising that Jesus's tomb was open and empty, they turned to find their eggs multicoloured. I use natural dies to colour my eggs. For reddish brown, I boil a handful of onion peel and eggs for about 15 to 20 minutes. For a deep ochre I add two teaspoons of ground turmeric, 1 tablespoon of vinegar to fresh water and eggs and boil them for 15 to 20 minutes. Once cooked, I lift them gently onto kitchen paper and let them cool before wiping them with a dab of vegetable oil to give them lustre. I nestled today's eggs in a deep cut glass bowl and some ivy from the garden. In true Libaliano style, the menu was a mix of flavours. With our drinks we ate fatayer (spinach filled triangles), pumpkin kibbe (pumpkin mixed with burghol and filled with walnuts and swisschard) and sambousak (crescent shaped pastries filled with meat and pine nuts). We started the meal with a steaming dish of crab linguine, followed by monkfish with caramelised onions in a saffron sauce served with steamed green beans. For dessert I baked a moist chocolate cake. However, Easter would not be Easter without maamoul, a Lebanese sweet pastry filled with dates and flavoured with orange blossom. 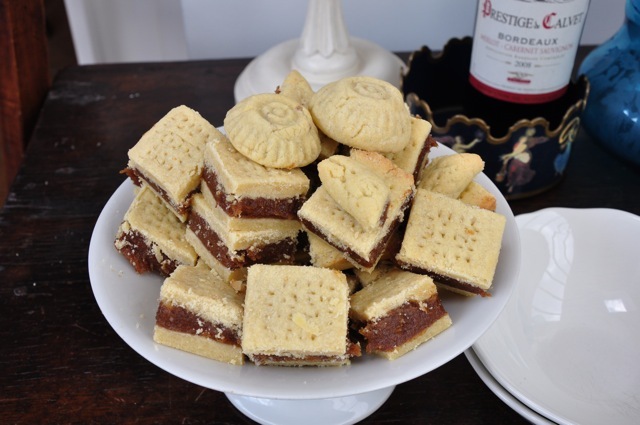 I did not have time to make individual cakes, so I layered pastry and dates in a baking dish and cut them it into squares. Mix the semolina, flour, sugar , baking powder, orange and rose water and mahlab together in a big bowl. Knead and leave to rest overnight. Place the dates, butter and flavourings in a food processor and blend until the mixture become a sticky paste. Butter an oven proof dish (18x12cm). Pre-heat the oven to 180°C. The next day the semolina mixture will be crumbly. You need to bring it together by adding 2 to 3 tablespoons of warm milk and knead it until it is soft and malleable. Divide the dough in two portions. Lay the first half in the bottom of an oven-proof buttered dish and pack it well. Place the date mixture over the semolina base. Cover with the rest of the dough making sure to smooth the surface. Bake in the centre oven for 30 to 35 minutes.